The struggles a private cargo capsule faced in orbit Friday reinforce the notion that spaceflight remains a challenging proposition, experts say. SpaceX's unmanned Dragon spacecraft launched smoothly atop a Falcon 9 rocket Friday (March 1), but only one of the capsule's four thruster "pods" activated after it reached orbit. After several hours of scrambling, SpaceX engineers turned the situation around, fixing the problem and bringing all four pods online for an engine burn that set Dragon back on course for the International Space Station. "Orbit raising burn successful. Dragon back on track," SpaceX founder and CEO Elon Musk wrote in a Twitter post Friday. Dragon is currently embarked on the second of 12 contracted supply runs to the orbiting lab for NASA. The capsule successfully executed its first official cargo mission to the station last October, but that flight didn't go entirely as planned, either. One of the Falcon 9's nine Merlin engines shut down prematurely, causing a telecommunications satellite that was riding along as a secondary payload to be placed in the wrong orbit. "Falcon 9 was designed to be the world's most reliable rocket, and today's launch validated this by adding to Falcon 9's perfect track record with our fifth success in a row," said Gwynne Shotwell, President of SpaceX. SpaceX and NASA are replanning Dragon's flight to the International Space Station. 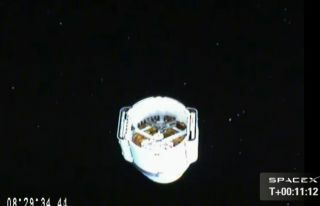 The capsule was initially due to arrive at the station early Saturday (March 2), but the thruster issue forced a delay. The space rendezvous could occur as early as Sunday (March 3), SpaceX officials said. Of course, SpaceX is far from alone in experiencing a few issues on the way toward the final frontier. The history of robotic and human space exploration is studded with glitches and outright failures, showing how tough it is to pull off a successful space mission, even after more than a half-century of practice. "There's absolutely nothing ho-hum about any spaceflight," said former NASA astronaut Michael Lopez-Alegria, president of the Commercial Spaceflight Federation. "It's a challenging business, there's no doubt about it." A big part of the difficulty stems from the huge amounts of energy the enterprise requires. Rockets must accelerate their payloads to about 17,500 mph (28,160 km/h) in just a few minutes to reach low-Earth orbit, giving engineers very little room for error. "Every time I witnessed a [space] shuttle launch that I wasn't on, it was gut-wrenching," Lopez-Alegria told SPACE.com. "The forces of physics involved are eye-watering, and you realize just how razor-thin the margins are. And you breathe a huge sigh of relief when the main engines cut off and you have a nominal insertion." Not every space shuttle mission ran this gauntlet successfully. The shuttle Challenger exploded 73 seconds after liftoff in 1986, killing all seven astronauts on board. And the shuttle Columbia suffered a fatal wound during launch in 2003 when a piece of foam from the orbiter's external tank broke off and punched through the heat shield on Columbia's wing. This left the shuttle vulnerable to the intense heat of re-entry, and Columbia broke apart in Earth's atmosphere on its way home, claiming the lives of its seven-person crew. Many unmanned scientific and commercial satellite missions have been scuttled by launch failures over the years as well, including Russia's Phobos-Grunt mission to the Mars moon Phobos in November 2011 and NASA's Glory climate-studying mission in March of that year. Getting into space in one piece isn't the only hurdle to clear, of course. A spacecraft's many systems and subsystems must also work flawlessly in the harsh environment of space, enduring extremes of temperature and radiation that we don't experience here on Earth's surface. And designing robotic explorers to do meaningful science work far from home only adds to the difficulty. Just 40 percent of the 40 Mars missions that have launched over the years, for example, managed to achieve their mission goals in full. But all is certainly not doom and gloom, as the list of space successes is long and growing all the time. And scientists and engineers learn more with every mission, robotic or manned, successful or not,. In short, we're getting better all the time. Lopez-Alegria voiced optimism that the nascent field of private spaceflight will eventually become extremely reliable, invoking the example of commercial aviation, which had a very bumpy start back in the 1920s and '30s. "The number of accidents was staggering, and look how long it's been since we've had a fatal accident in commercial aviation in this country," Lopez Alegria said. "So we have come an incredibly long way, and I think there's no reason to think that we can't do likewise in commercial spaceflight."